What Can You Use to Move Boxes Up Stairs? 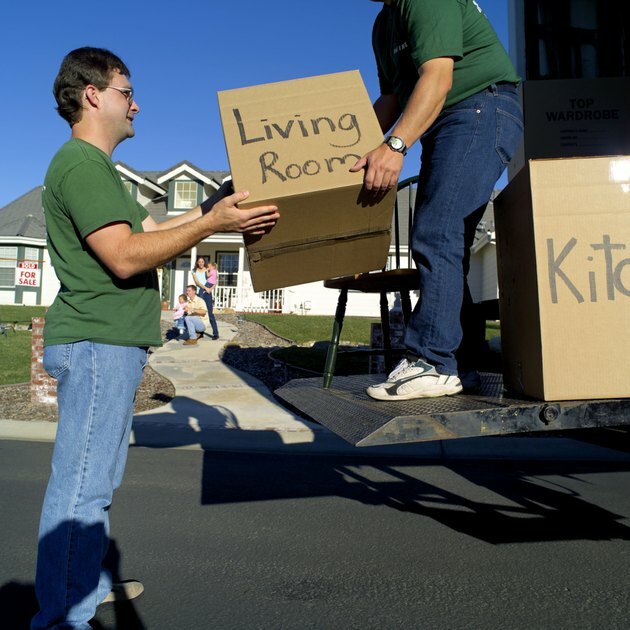 If you've just moved or are getting ready to move, you're probably looking for ways to move boxes up stairs without carrying them one at a time. There are a couple of ways to cart boxes up stairs on your own or with the help of a few friends. It helps if you label your boxes in advance so you know what's in each one and about how heavy it is before picking it up. No matter what method you use, remember to lift from your knees and stop if you become out of breath, overheated or dizzy. Labelling boxes helps you know how heavy they are. Hand trucks or dollies are good for moving multiple boxes up stairs. You can usually load two to three boxes on the dolly. Secure them with a strap or bungee cord pulled tight, and, facing the bottom of the stairs and stepping up backwards, pull the dolly up the stairs, one step at a time. Dollies are also easy to use on moving trucks with ramps and are narrow enough to fit through doors and down halls. Most can be maneuvered with one hand, although you'll need both for pulling a loaded one up the stairs. Most rental truck and box facilities also rent dollies by the day. Movers often flatten out cardboard boxes to make a slide on stairs, and you can do this, too. Empty and collapse empty boxes, and tape them together for the length of the stairs. Position one person at the foot of the stairs, one around the halfway point and one at the top. Slide boxes onto the slide and push them up from one person to the next. The person at the top will need to set aside each box as it reaches the top. Using a strap, you can carry two to three boxes on your back. Drape a circular moving strap around your shoulders and chest so that it falls behind your back. Lean slightly forward and hold onto the bottom of the strap. Have a friend place a box on your hands and the strap, making sure the strap is in the center of the box. Depending on your strength, have your friend add one or two more boxes. Don't stack any boxes higher than your head. This method lets your back to the lifting, rather than your arms and legs. Lean slightly forward as you go up the stairs. Smaller boxes, such as book boxes, can often fit into backpacks and tote bags. Place the boxes flat at the bottom of the bags, then raise the bags to your shoulders, bending your knees to avoid straining your legs or back. If the backpack has a waist belt, use it to help you carry the load. Kochava R. Greene has been a freelance editor since the early 1990s. She has served as a developmental writer on topics ranging from political science to economics. Greene has written on gardening, cultural and social topics, pet care, cooking and more for Demand Studios.